It's that time of year again! 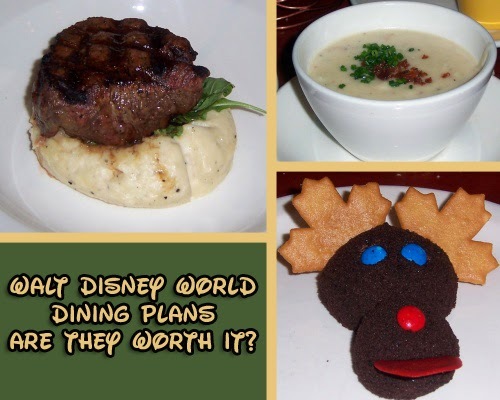 The time has arrived once again where we take a look at the Disney Dining Plans. The 2014 Disney Dining Plans have quietly been increased. Not a whole lot of changes took place, besides the pricing. The Quick Service Dining Plan allows each guest to get 2 Quick Service Meals per day. For Breakfast you'll receive an entrée or combo meal and a non-alcoholic beverage. For Lunch and Dinner you'll receive an entrée or a complete combo meal, dessert, and a non-alcoholic beverage. You'll also get 1 Snack Option per day, and 1 Refillable Mug per person for the length of your stay. The Basic Plan (Also known as the Standard Plan) comes with 1 Quick Service Meal per day, which includes an entrée or combo meal, dessert (lunch or dinner only), and a non-alcoholic beverage. You also get 1 Sit Down Meal per day which includes entrée, dessert (lunch and dinner only), and non-alcoholic beverage, or, if eating at a buffet, the full buffet. You'll also receive 1 Snack Option per day and 1 Refillable Mug per person. For the Deluxe Dining Plan, guests receive 3 Meals, which can be any combination of either Table Service Meals or Quick Service meals. Table Service meals include an appetizer (lunch and dinner only), entree, dessert (lunch and dinner only), and a non-alcoholic beverage. Or, if eating at a buffet, the full buffet. Quick Service Meals include an entrée or combo meal, dessert (lunch and dinner only and a non-alcoholic beverage. Also included in the plan are 2 Snack Credits per day plus one resort refillable mug per person for the length of stay. The biggest question that I hear though is, "Is the Dining Plan Worth It?" Is it a good value? One thing to keep in mind when deciding on whether to purchase the dining plans is that gratuities and any extras like alcoholic beverages and appetizers (with the exception of the Deluxe Dining Plan...appetizers are included on that) are not included in the prices listed above and will be added at an additional charge. Be mindful of that when you are budgeting to see if the dining plan is worth it for you, because if you like an adult beverage or two (or three) or often eat appetizers with your meals, the plan may not work for you. Other things to keep in mind: I have head that if you have children in your party, if they are under 9, the dining plan can work out to be a decent value. If they are considered to be an adult on the dining plan (10 and up) then it's usually not such a good value, cause a lot of times, they are still wanting to choose options off the kids menu, which of course, costs less money. If you'll be eating a lot of buffets, then the dining plan may be a good option though. The buffets are among the priciest of choices, so it may work out to be a little bit in your favor to get the dining plan. For my family, the Disney Dining Plan never works out to be a good deal, because my husband doesn't eat dessert. Therefore, that portion goes out the window and I'm just throwing away good money after bad. So, if you have someone in your family who doesn't care for dessert, then don't get the dining plan. Overall, no matter what you decide, Disney has a ton of dining options that will fit anyone's taste and budget. Whether you decide on the Dining Plan or not. If you like this article, I shamelessly ask that you spread the word! Share it on Twitter or Facebook...pin the photos on Pinterest...hit up the Google + emblem...just let others know about us here!